Save, Spend, Splurge: Get These Products To Up Your Brow Game! Bold, groomed eyebrows can totally transform your face and your make-up look. If you’re new to the whole brow-game, finding your go-to product can be quite overwhelming. How do you choose one? A brow pencil, brow pomade, brow gel, brow powder...which one do you buy? Luckily for you ladies, you’ve got us and our arsenal of celebrity make-up artists. Cheating your way to that gorgeous arch just got easier! We’ve got not 1, but 3 amazing products that promise you bangin’ brows all year long! Check out our list for every budget. Save: The Maybelline New York Fashion Brow Duo Shaper (Rs 300) is perfect for beginners, it is a dual-ended eyebrow pencil with a brow powder on one end. The pencil is perfect to fill in your brows and the powder adds colour and fills in any spots the pencil may have missed. 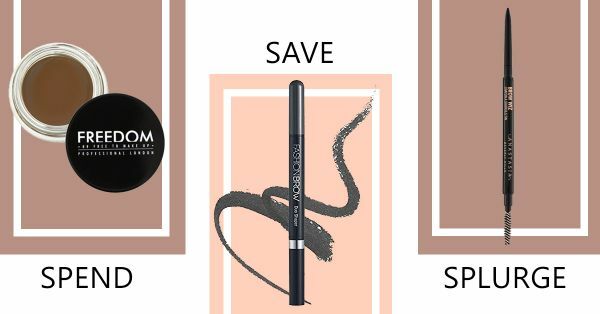 Spend: The Freedom Pro Brow Pomade (Rs 900) is a great option for someone comfortable using an eyebrow brush. Use the pomade if you want a strong brow game. Psst: This is a total dupe for its high-end counterpart! Splurge: The cult favourite, the Anastasia Beverly Hills Brow Wiz (Rs 1,491) is an eyebrow pencil with a spoolie on one end. This is your make-up artist and Instagram favourite brow product. It gives your brows an instant transformation. If you’re looking to splurge - pick this! We hope your search for that holy grail brow product has ended here. Happy brow-ing!